(Scroll down for video) The Democratic National Convention brought many people to Charlotte, North Carolina, resulting in heavy traffic. Police officers were sent out to direct traffic and keep order. Sitting in traffic tends to irritate many drivers who are caught up in major delays. The slow moving traffic can equally irritate police officers who have to direct the irritated drivers. For police officers, standing on the street for hours at a time directing traffic can be very boring. 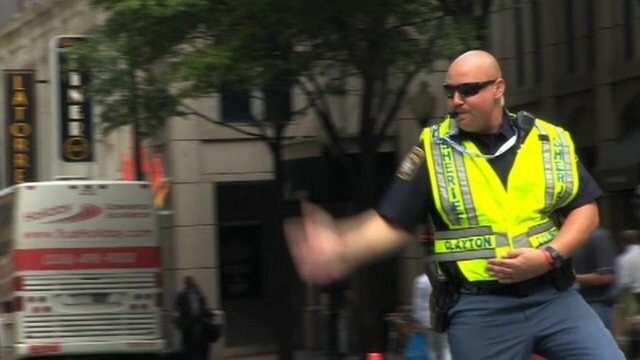 Two police officers, who are in charge of managing the slow moving traffic in the area where the Democratic National Convention was held, decided to make their job more fun for themselves as well as for the drivers. The officers danced as they controlled the traffic resulting in drivers being more patient. Pedestrians waiting to cross the street also enjoyed their wait as many of them took videos of the dancing police officers.